The KTM 790 DUKE is devastatingly accurate. 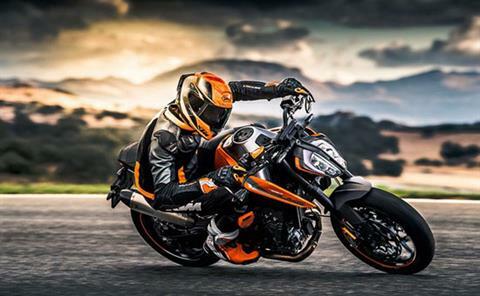 With the agility and purity you'd expect from a single, combined with the hard-hitting punch of a twin, the KTM 790 DUKE carves up the road with pinpoint precision. Boasting the all-new, compact 799cc LC8c parallel twin motor, nestled into one of the lightest frames around, the new KTM 790 DUKE is all about being fast everywhere, especially the corners. The delivery of the 105 hp (78 kW) and 87 Nm is efficiently controlled by advanced electronics and next-generation rider aids, making it impressively easy to race ahead of the pack. TFT DASHBOARD: A multicolor combination of relevant information, presented in an uncluttered way. As you rev the engine, the display bars change color, either spurring you on or warning you that the engine’s still cold. The display also automatically adapts its illumination to the ambient light and gets racy when TRACK mode is selected. LED LIGHTS: Form and function are seamlessly integrated in the 790 DUKE. Take the LED headlight for example, a highlight in this bike’s design and a clear referral to the 1290 SUPER DUKE R. It combines optimal illumination of the near field with maximum light output. And the daytime running lights on both sides ensure that the motorcycle is perceived better and is more differentiated by other traffic users, thus offering massive safety benefits. The LED taillight is mounted on the license plate holder to make it easy to remove for trackday use or customization. 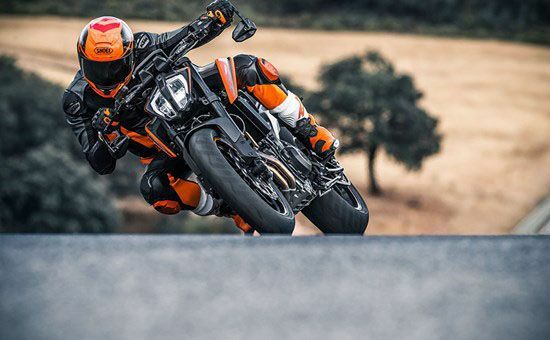 BRAKES: Maximum deceleration is ensured at the front wheel on the KTM 790 DUKE by the two radially mounted four-piston fixed calipers with 300 mm twin-disc brake and a radial hand pump. The spacing between hand brake lever and handlebar is adjustable so that the lever is within easy reach for every rider. The front brake receives effective support from the disc brake on the rear wheel, which features a single disc and a two-piston caliper. All this stopping power is supported by KTM’s Cornering ABS. FRAME: When designers and engineers can start from a blank canvas, beauty meets performance. Take this chrome-molybdenum tubular frame, which makes a major contribution to the bike’s excellent chassis geometry, for example. It’s a laser-cut, robot-welded thing of beauty with a glorious surface finish. And it can count on the engine as a load bearing element, so there’s much less material needed for it to be strong and stiff. This lean machine will flick into corners at the blink of an eye, extracting every possible smile out of every possible mile. SUBFRAME: The subframe is cast aluminum and houses the airbox. No plastic covers, no additional brackets - everything is cast in one single piece to reduce complexity and weight. 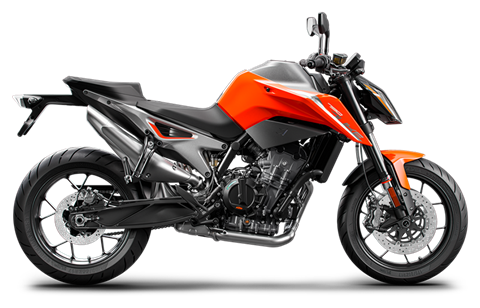 The triangular shapes in the subframe were inspired by KTM’s trellis subframes, as this allows for a strong and simple construction. SWINGARM: The die-cast, open-lattice swingarm is meticulously manufactured and has been optimized for stiffness and stability while still offering excellent flex characteristics. By using a direct link for the rear shock, complexity and parts are reduced. ENGINE: Built for torque, this liquid cooled 8 valve unit delivers 86 Nm at 8000 rpm, almost immediately followed by a roaring 105 hp finale. Meanwhile, an advanced ride-by-wire system guarantees great refinement as well as low fuel consumption and emission figures. CYLINDER HEAD: The 8 valve DOHC cylinder head contains twin chain-driven camshafts and one sparkplug per cilinder. The camshafts are assembled, which makes them lighter than forged camshafts. The steel valves are opened by DLC coated finger followers and the camchain is tensioned by a hydraulic chain tensioner. BALANCER SHAFTS: Vibrations are taken care of by two balancer shafts, one in front of the crankshaft and the other in the cylinder head between the two camshafts. Smooth move. CYLINDERS: The coated aluminium cylinders are an integral part of the sleeveless engine casing. The open deck cylinder construction allows for optimal cooling and improved production tolerances. PISTONS: Forged pistons with three piston rings in a plain conrod bearing, combined with a DLC (Diamond Like Coating) coated piston pin allow for lighter pistons. This minimizes reciprocating weight, which reduces rotating masses, improving the handling and maximizing the rev-happy nature of the engine. CRANKCASE: The horizontally split crankcases (a first for KTM) are an aluminium high pressure cast, which allows for reduced wall thickness and, again, less weight. PASC CLUTCH: Not only does this pressure lubricated slipper clutch open when the engine back-torque becomes too high, it also assists when you open up the throttle. The former prevents destabilizing rear wheel chatter when braking sharply or decelerating; the latter reduces the hand force required for changing gear, allowing the clutch to be controlled with one trigger happy finger. OIL CIRCULATION: The engine employs a compact, semi-dry sump system. Oil is actively pumped out of the crank case, clutch housing, and gearbox. This ensures that it does not unnecessarily flow through the engine, reducing power loss through friction. To cool down the oil, the engine is equipped with an oil cooler similar to the larger LC8 engines. RIDE-BY-WIRE: Instead of the electronic injection system's throttle valves being controlled by cables, ride by wire generally processes throttle twist grip movements with the help of electronic sensors and activates the throttle valves accordingly using servo motors. However, our ride by wire on the KTM 790 DUKE goes the extra mile: It electronically translates the throttle commands of the rider into the best throttle valve positions for the current riding situation. Choking, jolting and involuntary wheelies are a thing of the past. Voluntary ones, however, could easily be a thing of your future. EXHAUST: A stainless steel thing of beauty. The middle damper centralizes mass and allows for a relatively small muffler that plays a dramatic soundtrack to possibly huge lean angles. Hundreds of test bench runs and complex simulations ensured that this exhaust system contributes decisively to the tractable torque curve and excellent emission values. AIRBOX: The airbox sits snugly inside the subframe, with the air intake on the sides, allowing the bike to keep things cool while you gun it. HANDLEBAR: A tapered aluminium, 760 mm wide handlebar puts you in full control. It’s adjustable in 4 positions on the triple clamp and can be rotated in three further positions. FOOTPEGS: The cast aluminium footrests cater to a comfortable riding position, while still creating maximum ground clearance to allow for a high lean angle. Reverse (race) shifting is possible without any additional parts. Adjustable footrests are available as a POWERPARTS option for those who would like go all out. SEATS: At 825 mm, both shorter and taller riders can enjoy the bike at full tilt, without losing sight of the daily usability. The seat cover is grippy but still allows the rider to move around the bike easily. It has been developed to work with textile and leather, in keeping with the wide range of riders and riding styles. The pillion seat cover uses the same material and combines sharp looks with passenger comfort. 805 mm is possible with the lower POWERPARTS seat. RIDE MODES: Ride modes regulate the performance output and the ‘character’ of the motorcycle according to riders’ preference. The riders’ throttle commands are electronically translated into throttle valve positions perfectly suited to the riding conditions. The various ride modes control several things at the same time, while the Track mode allows the rider to adjust individual settings for a number of features. The four ride modes are: 1. Sport: has the most direct throttle control, allows respectable drifts and a perceptible amount of slippage. 2. Street: keeps things smooth for comfortable, controllable riding. 3. Rain: is all about early intervention and maximum grip in the wet. 4. Track: customize your ride, dial down the traction control, smooth out the throttle, switch off the anti-wheelie. TRACK MODE: Track mode offers unlimited thrills. It features launch control, slip adjuster, throttle response control, free engine map selection and allows you to pull epic wheelies. 1. Anti-wheelie: Anti-wheelie is a sub function of the traction control aimed at always keeping the front wheel on the ground. But on a track it can be desirable to allow the front wheel some lift to ensure maximum forward momentum. In track mode, the anti-wheelie function can be switched off. 2. Launch control: Launch control keeps the engine rpm pitch perfect for a rocket start. To thunder off into the distance, the rider just releases the clutch and keeps the throttle pinned. The launch control will maintain an optimum level of engine output, while limiting rear wheel spin and front wheel lift to ensure maximum acceleration. Fire in the hole! 3. Traction Control spin adjuster: Standard traction control limits the engine torque when the system detects excess slip at the rear wheel. TC spin adjuster was developed so advanced riders on racetracks can use wheel spin to accelerate when (slick) tires start to wear down. The system allows the rider to choose the level of intervention of the traction control. The maximum intervention allowed is selected by the rider. 4. Throttle response: The throttle response allows the rider to dial in how quickly the bike responds to his or her right hand. The system has a choice of 4 levels: Track, Sport, Street and Rain, with Track being the most aggressive one. After the mapping selection, the rider can also adjust the slippage of the rear wheel, as well as the anti-wheelie off and launch control function and keep it stored in the system even when turning off the ignition. MOTORCYCLE TRACTION CONTROL (MTC): The Motorcycle Traction Control (MTC), a lean-angle sensitive traction control system, reacts immediately if the rotational speed of the rear wheel is disproportionate to the riding situation. In a matter of milliseconds, MTC reduces the engine output with an extremely smooth, barely perceptible intervention at the throttle valves, until the system has reduced slippage to optimum proportions for the selected ride mode and current angle of lean. Depending on the selected ride mode, MTC allows several levels of traction slip at the rear wheel. ‘Sport’ is up for respectable drifts and a perceptible amount of slippage, ‘Street’ keeps things smooth for comfortable, controllable riding with full engine power, ‘Rain’ is all about early intervention and maximum grip in the wet. All this means that the rider can concentrate on the run of the road and other road users – the guarantee for maximum performance and ultimate riding pleasure, but also a decisive contribution to active safety. On track, Track mode allows the rider to control the level of MTC intervention with Spin adjust. And that’s not the end of it. Daredevils, we give you: the off-switch. 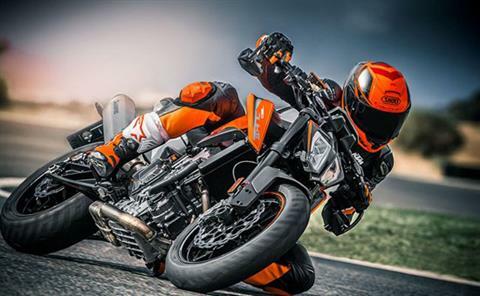 QUICKSHIFTER +: The KTM 790 DUKE comes equipped with a Quickshifter + that allows slick, clutchless up- and downshifts under any load. It reads and responds to your riding, so the shift action is fast when you are, but buttery smooth at half-throttle. When downshifting, the system matches the engine speed to the speed of the lower gear. And if you’re in the mood for a bit of old school, you can just switch it off. Main benefits: 1. Shorter shift times. 2. A more precise and smoother ride, since clutch actuation and backing-off the throttle are no longer required. 3. The load reversal impact on the rear wheel is noticeably reduced. 4. Rear wheel traction is improved. 5. The rider can keep full grip on the handlebars. 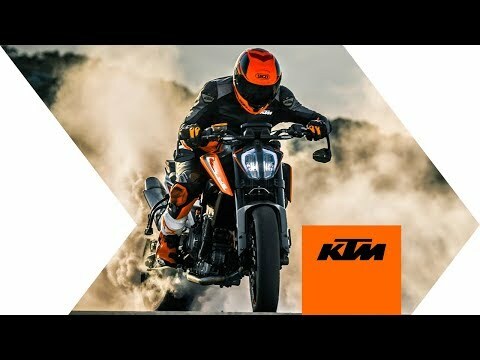 MOTOR SLIP REGULATION (MSR): The 790 DUKE is equipped with standard MSR (Motor Slip Regulation), which is an engine brake control that works in the opposite direction of the MTC. If, due to shifting down or abrupt throttle-off, the engine drag torque is too high, the ride-by-wire system balances the throttle exactly as much as is needed to ensure a controlled deceleration. MSR complements the slipper clutch and is especially effective in low grip situations. SUPERMOTO MODE: The fun-loving Supermoto mode allows the rider to block the rear wheel - a prerequisite for committed Supermoto riding and deliberately executed slides. The ABS function remains active on the front wheel, even in this mode. MOTORCYCLE STABILITY CONTROL (MSC) WITH CORNERING ABS: The ultimate in safe deceleration: one component of the comprehensive Bosch MSC assistance package is the lean-sensitive cornering ABS. Based on the high-quality 9.1MP modulator, it unites the talents of combined braking and lightning-quick, efficient pressure modulation with the high quality brake components to make the most advanced braking system on the market - no-one brakes more progressively or safely, even at extreme lean angles. If required, not only can it be switched off, but also placed in SUPERMOTO mode. This allows the rider to block the rear wheel when required - for committed riding and deliberately executed slides. The ABS function remains active on the front wheel, even in this mode. WHEELS: The tubeless sport tires are fitted on extremely lightweight, light-alloy wheels manufactured in a low-pressure die casting process. Not only do the lightweight wheels make the bike lighter overall, they also minimize the unsprung masses and moment of inertia, with a positive impact on the handling and ride dynamics. 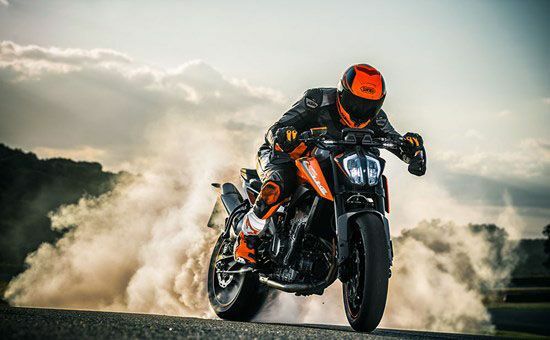 TIRES: The 790 DUKE is fitted with Maxxis Supermaxx ST tires in a special compound developed specifically for the bike. The tires are grippy in both wet and dry conditions and strike a balance between sportiness and everyday rideability. 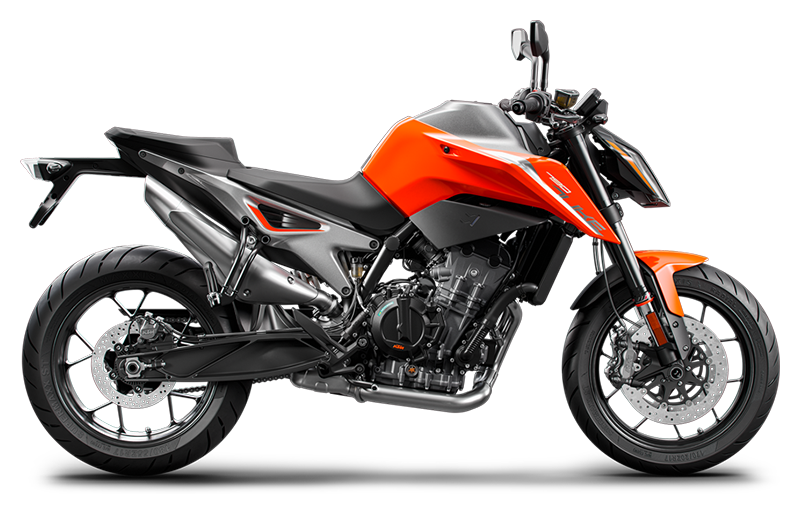 The sporty character of these tires fits the 790 DUKE, while offering the rider a stable ride and excellent tire wear. FRONT FORK: The 43 mm open cartridge upside-down fork from WP Suspension provides you with a suspension set-up that’s unseen in this segment. The fork uses split function technology, which means that compression and rebound damping take place in separate fork legs, allowing for better tuning of the fork behaviour. The fork springs are progressive, ensuring a smooth operation throughout the fork stroke; soft for the initial stroke and harder further down the stroke to prevent bottoming out. REAR SHOCK: State-of-the-art, gas assisted WP shock with progressive spring and preload adjustment. STEERING DAMPER: This reliable and sensitive WP steering damper has been setup to give the rider a secure feeling, while keeping the agile riding character of the bike. You won’t even know it’s there, until that one nasty bit of road comes up from behind the corner. TRIPLE CLAMPS: The cast aluminium triple clamp stiffness has been tuned to match the flex of the fork, contributing to the sporty handling and excellent feedback. By cleverly engineering the triple clamps and the handlebar clamps, four different handlebar positions are possible.